It is a public transport system that consists of trains that run underground, so it is known as a subway. It is located within the city of Glasgow, the most populated in Scotland, in the UK. This subway was inaugurated in 1896, making it one of the oldest metro systems on the world (the 3rd oldest, to be precise). It has a single circular line that runs for 10.5 km and is served by 15 stations distributed on both the north and southern banks of the Clyde river. It is the only subway system in the UK apart from London’s famous ‘Underground’. The metro operates completely beneath the surface. It is priced depending on the type of ticket acquired. 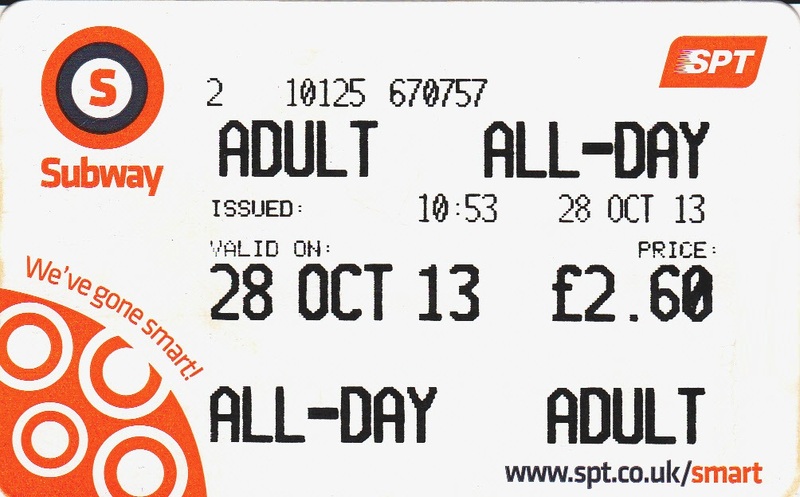 A single trip with the Smartcard goes for £1.45 (about $1.88 USD), while a normal ticket costs £1.65 ($2.14). Its operating hours are the same for most days of the week, going from 6:30 in the morning until 11:40 p.m., except on Sundays, when it is open from 10 a.m. to 6:10 p.m.
Glasgow is the most populated city in Scotland and the 3rd most populous one within the UK, after London and Birmingham. The city, located in the southern part of Scotland, is divided by the Clyde river. Historically, it has always been a relevant port, especially renowned for its shipyards. Although the city by itself has only about half a million people, the total population of the Greater Glasgow Urban Area is much larger and is close to two million inhabitants, which is about 41% of the total population of Scotland. Glasgow is the economic capital of Scotland, as well as a touristic destination. Due to its geographical location, is has milder weather than the rest of the country, with temperatures ranging from 10° to 18°C in the summer and from 1° to 8°C in the winter. The Glasgow metro runs for 10.5 km and is already considered a historical monument, as it was initially inaugurated in 1896. Its only circular line has never been expanded, although the trains and stations have been modernized. The subway currently operates with renovated trains dating back to 1970, and were built by the now extinct Metropolitan Cammell Carriage and Wagon Company (MCCW). The trains were painted orange, color that is now characteristic and symbolic of the system. About 35,000 people use the metro every day. It is run and operated by the Strathclyde Partnership for Transport, a public entity that also controls the trains around the region. The Glasgow subway is the 3rd oldest in the world, apart from the London Underground and the Budapest Metro. Construction began in 1891 and it was opened to the public in December of 1896. It was initially powered by cables that pulled the trains on both ways of the circular line. Many of the original wooden wagons remained operational until 1977. In 1935, the cable system was removed and an electrical line was implemented in its place to provide traction for the trains. However, due to its age and lack of maintenance, the system decayed rapidly to the point of intermittent service and partial closure. It was not until this point that a major decision was taken: the renovation and modernization of all facilities and stations, the replacement of all trains for new rolling stock and the adoption of a unique and unified identity. New ticket vending machines were also installed. However, it is only recently that an expansion of the current system has been proposed, an extension towards the south of the city. There are only projects at this point, though. The system functions completely underground and has a total of 15 stations. The only line is circular and runs both ways: an Outer Circle that goes clockwise and an Inner Circle that runs counterclockwise. The first station on the northern side. It was named ‘Merckland Road’ until 1977. It connects with the train station of the same name, and is one of the main transport hubs of the system. Second station located on the northern side. It was originally called ‘Partick Cross’, until its name was changed in 1977. Because of its surroundings, this is one of the stations tourist use the most. With more than 1.8 million passengers each year, this is the third busiest station in the system. It serves the historical University of Glasgow. It serves the Woodland, Woodside and Hillhead districts. It is, alongside Hillhead, the northernmost station of the metro. It also serves the Woodland area, as well as Queen’s Cross. Located in the northern side of the river, it serves the characteristic Chinatown. It is the busiest station of the system, with more than 2.5 million passengers each year. It is located on the street with the same name, known for its shops and commerce. It connects with the Queen Street train station. It is the second most active station, serving about 2 million people every year. It connects with other transports such as trains at the Glasgow Central Station and is also connected to Argyle Street. It is the first station on the southern side of the river (if moving clockwise on the Outer Circle), on the eastern side of the line. It serves the Laurieston district in the Gorbals area. It is the least concurred station of the subway because it is located within an industrial zone, so it is not densely populated. As most stations on the southern side of the Clyde river, this station is located near areas that were industrial zones in the past. It serves the Pollokshields district. It serves the Kinning Park suburb, from which it gets its name. It is the narrowest of the stations and preserves the original single islet configuration. It provides service to the Cessnock area and to the Ibrox district. The BBC Scotland and Glasgow Science Centre are close by. It was known as Copland Road until 1977, and serves the district of Ibrox. The Ibrox Stadium is very close to this station. Final station on the southern side of the river. It was known as Govan Cross until the renovation in 1977. It serves the Govan district. The Glasgow subway is quite small, and since it has never been expanded, it has fallen short and does not supply all needs for public transport within the city. Because of this, it has become increasingly important that it be connected to other forms of transport, namely the suburban and intercity trains, as well as the bus lines. It was not until the aforementioned renovation of 1977 that any formal connections with other transports were made. As of today, the most relevant connections the Glasgow subway system has are with the National Rail train stations. Partick station has a link with suburban train lines North Clyde and Argyle. Buchanan Steet station is a key element, as it is directly connected to the Glasgow Queen Street station, a railway terminal that serves many other lines such as: North Clyde, West Highland, Croy, Cumbernauld, Maryhill, Highland Main, Glasgow-Edinburgh, Glasgow-Aberdeen and the nocturnal Caledonian Sleeper. Lastly, St. Enoch station provides connection to the Argyle Street railway station and, more importantly, to the Glasgow Central station that serves 13 railway lines: CrossCountry, West Coast Main, East Coast Main, TransPeninne North West, Lowland Caledonian Sleeper, Argyle Line, Ayrshire Coast, Inverclyde, Cathcart Circle, Paisley Canal, Shotts, North Berwick and Glasgow South Western. Apart from railway stations, the Glasgow subway is also connected to many bus lines. This form of transport is not unified in the city, so there are several companies that provide this service. One of the most important is First Buses, a company that has stops on most of the subway’s stations: Partick, Kelvinhall, Hillhead, Kelvinbridge, St. George’s Cross, Cowcaddens, Buchanan Street, St. Enoch, Bridge Street, Cessnock, Ibrox and Govan. Another important one is McGill’s, as it is present on Partick, Kelvinhall, St. Enoch, Cessnock, Ibrox and Govan stations. There are also several others that serve one or two subway stations, specially Buchanan Street, as this is an important bus hub that connects 13 different lines. The Glasgow Subway is not directly connected to the Glasgow International Airport (GLA). This, however, is not a difficult obstacle to overcome, as they are very well linked by many bus lines that run between them. From the airport, many First Buses lines provide service to the city, and among which is Service 500, a route that connects to Buchanan Station for £7.50 (about $9.72 USD). Buses leave every 10 minutes. There are also other similar routes from Traveline Scotland, McGill’s and Citylink. As the subway is a one-line system, any matter related to this topic is simplified. It operates most of the day from Monday to Saturday and it maintains a constant timetable, so it is a very good option if you want to get around the central part of the city quickly and with ease. Normal operating hours go from 6:30 in the morning to 11:40 at night, Monday thru Saturday. On Sundays, the subway is open from 10 a.m. to 6:12 p.m. Specific timetables are kept: in the Outer Circle, the first train leaves Govan station at 6:30 a.m. and another one departs St. Enoch at 6:32 a.m. At night, the last ones arrive at 11:16 and 11:30 p.m. respectively. In the Inner Circle, this is also true, except for the last train to St. Enoch, that arrives at 11:28 p.m.
On Sundays, the operating hours are greatly reduced. On the Outer Circle, the first train leaves Govan al 10 in the morning and at 10:03 at St. Enoch. The last one arrives at 5:50 p.m. and 6:03 p.m., respectively. On the Inner Circle, trains commence their routes at 10 a.m. on both stations, but the last one arrives at Govan at 5:50 p.m. and the final one to serve St. Enoch arrives at 6 o’clock. A complete circle around the line takes about 24 minutes. At peak times, trains leave every four minutes, but this can be extended from 6 to 8 minutes if demand is low. In the Glasgow Subway, a single ticket is valid for an indefinite amount of time, so you can ride as long as you like until the subway closes, provided you don’t leave the premises. Firstly, we have the paper tickets. A single ticket for adults costs £1.65 ($2.15 USD), while a ticket for children under 16 costs £0.70 ($0.91 USD). Children under 5 travel free when accompanied by a fare paying adult. Roundtrip tickets are available at £3.10 ($4.03 USD) for adults and £1.35 ($1.76 USD) for minors. There is also an unlimited day pass that goes for £4.00 ($5.20 USD). Another more popular way of paying is through a ‘Smartcard’. This card can be bought at any station for £3.00 ($3.90 USD) or free if you preorder via the internet. All adult tickets are sold at a discount if you have a Smartcard. Single tickets cost £1.45 ($1.89 USD), while unlimited day tickets go for £2.80 ($3.65 USD). You may also buy a 7-day unlimited pass that go for £13.00 ($16.92 USD) for adults and £6.50 ($8.46 USD) for minors, or a 28-day unlimited pass that will cost £50.00 ($65.09 USD) for adults and £25.00 ($32.55 USD) for minors. There are also two more season tickets that are intended for people who live in the area: a 6-month and a 12-month pass. They cost £250.00 ($325.46 USD) for adults and £175.00 ($227.82 USD) for minors and £450.00 ($585.82 USD) for adults and £225.00 ($292.91 USD) for minors, respectively. Some other tourist-oriented options are available, such as the ZoneCard or the City Sightseeing bus tour ticket that include subway fares in their cost. Parking lots are available as a means of reducing car traffic within the city centre and encourage travel by subway. Currently, there are three such installations. They are located at Bridge Street station (159 parking spaces), Kelvinbridge station (150 spaces) and Shields Road (with up to 800 parking spaces). Pricing vary according to payment methods. The basic all-day tariff per car is £5.20 ($6.76 USD). There are many other options with the Smartcard, however. A 30-minute stay will cost £0.50 ($0.65 USD), while two hours amount to £2.50 ($3.25 USD). You may also acquire weekly, monthly or even yearly passes with this card. The Glasgow Subway is quite exceptional in the sense that not only is it a subway system that dates back to the 19th century, but that since its opening in 1896, it has not been expanded or modified. It continues to operate with its original 10.5 km length and 15 stations. As bizarre as it may seem, there are no set plans for expansion in the near future. SPT, the operating company, announced in 2005 it was conducting studies on the matter, considering the enlargement of the subway towards West End, East End, South Side and Glasgow Harbour. In 2007, the results were in: they proposed the expansion of the system with 7 new stations and the modernization of all the current ones. This last recommendation is being followed with an ambitious plan to bring the subway up to date, but there is no concrete action yet on the expansion front. As it was built in the 19th century, the increasing height of individuals was not taken into consideration, so any person who is significantly higher than the average must be careful while in the Glasgow subway, as it is easy to bang your head with multiple things, and must be especially attentive while boarding the train. Even though it is a small, well-guarded system, the fact that many tourists use it mean that people must always be careful with pickpockets, as they circle for the unaware or distracted visitor. Due to the dimensional restrictions, large bags or over-sized luggage are not allowed inside the trains, as they pose a nuisance to other passengers. Though there is no official prohibition, bulky items will not be welcome in the Glasgow subway. It was originally propelled with cables. It is the 3rd oldest subway in the world. The same afternoon that it was inaugurated, a wagon crashed into another as they crossed the tunnel beneath the Clyde river. As a result, the system was closed until the next month. Four people were injured in the incident. The Glasgow subway is referred to in many novels and literary works as The Clockwork Orange, nickname derived from the movie of the same name directed by Stanley Kubrick, and the fact that the trains were painted orange following the renovation in the 70s. There is a rather famous (or infamous, if you prefer) challenge called the ‘subcrawl’, and it consists of completing the circle while stopping at every station and going out to a local pub to drink, one pub per stop. Riverside Museum: inaugurated in 2011, it is the Museum of Transport of Glasgow. It is architectonically impressive, and was granted the ‘European Museum of the Year Award’ in 2013. It is closest to Partick station. University of Glasgow: founded in 1451, it is the 4th oldest university in the English-speaking world. It can be reached via Kelvinhall, Hillhead or Kelvinbridge stations. Glasgow Botanical Gardens: they are among the most important botanical gardens of Europe. It covers 11 hectares that shelter many different species, both outside and in greenhouses. It is served by Hillhead station. Buchanan Street: Glasgow’s quintessential shopping street. It has many different shops and department stores. It is just outside Buchanan station. Glasgow Science Centre: one of the most popular tourist attractions in Scotland. It has three buildings: the Science Mall, the Glasgow Tower and an IMAX screen. It is reachable by Cessnock station. Ibrox Stadium: a football (soccer) stadium, home to the Rangers F.C. It can accommodate over 50,000 people. It is very close to the Ibrox station.